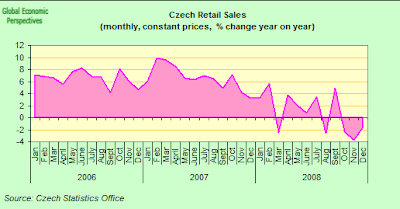 Well as forecast on this blog (see also here), the Czech Republic’s economy contracted in the last quarter of 2008. Since the economy is still contracting sharply, we will more than likely now see a second quarter of negative growth, which means the CR is now in recession. The Czech economy contracted less than expected in the fourth quarter but the outlook for this year remained grim due to collapsing demand in the euro zone slashing Czech exports. The Czech Statistical Bureau said on Friday the central European country’s output dropped by 0.6 percent quarter-on-quarter, adjusted for seasonal and calendar effects, the worst number since 1997. Year-on-year, the economy eked out 1.0 percent growth, much better than 0.2 percent expansion forecast in a Reuters poll of analysts but a drop from 4.2 percent growth in the third quarter. “It doesn’t really change the outlook going forward,” said Raffaella Tenconi, analyst at Wood & Company. “We’re looking at -2.0 percent growth for all of 2009, and if anything, there are downside risks to it,” she said. Inflation adjusted Czech retail sales, excluding cars and car parts, dropped 0.8% year-on-year in December compared to a 3.4% fall in November. Month-on-month, retail sales at constant prices were flat in December, after falling 0.5% in November. Retail sales for food, beverages and tobacco increased 0.9%, while sales for non-food goods dropped 0.5%. This means that sales fell, compared with a year earlier, every month during the fourth quarter. Czech industrial output also declined for a third consecutive month in December, sliding 14.6 percent from December 2007 following a 17.4 percent drop in November. Czech companies are evidently suffering from the slowdown which now affects the whole euro region, which is the main destination for Czech exports. 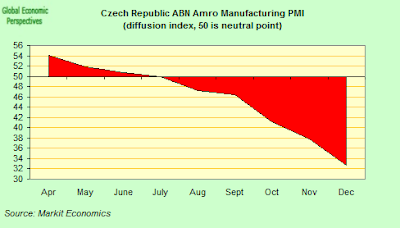 In fact Czech industry continued its steep decline in January with the Czech Purchasing Managers’ Index falling to dropping below the 50 mark (to 31.5) for the seventh consecutive month. As compared with December (32.7), the PMI was hit by series-record declines in new orders and employment, while deflationary pressure was also evident as both input and output prices continued to fall sharply, according to the report from Markit Economics and ABN Amro. The figure for output rose for the first time since September, to 29.5, indicating a slightly weaker rate of contraction than in December but still the second lowest in the survey’s history. 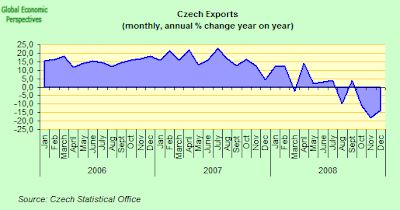 Of course, since the Czech economy is at least partially fuelled by foreign trade, the external situation is hardly helfpul, and both exports and imports fell in December – by 13.4% and 8.2% year-on-year, respectively. The drop in exports was the largest December year-on-year fall since 1994. Exports and imports have now been declining for three consecutive months. The trade balance showed a deficit of CZK 11.8 billion, a deterioration of CZK 9.0 billion year-on-year. Over 2008 as a whole, exports were down by 0.7% and imports rose by a minute 0.1%. The annual trade balance had a surplus of CZK 69.4 billion, which was CZK 18.5 billion less than the 2007 one. Seasonally adjusted exports fell month on month by 7.8% while imports grew by 0.1%. Czech consumer prices growth slowed in January while unemployment soared more than forecast as companies slashed jobs in the face of the deepening economic crisis. Monthly price growth of 1.5 percent put year-on-year inflation at 2.2 percent, sharply down from 3.6 percent in December. The drop was attributable to base effects and falling fuel and clothing prices, which brought the headline figure to the lowest level since March 2007 according to the Czech Statistical Bureau. 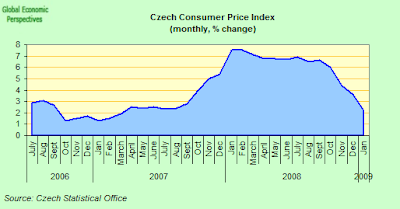 The Czech National Bank (CNB) now forecast that inflation will fall near to zero during the course of this year. The bank is hopeful that by the beginning of 2010, inflation will once more approach their new 2-percent inflation target, but I think the scale of the economic contraction will determine that more than anything. The month-on-month consumer price increase of 1.5% was mainly the result of a price rise in administratively regulated prices, which were up by 5.8%, while market driven prices only rose by 0.4 %. The growth of regulated prices was largely the result of price increases for ‘housing, water, electricity, gas and other fuels’. Electricity increased by 11.6 %, heat and hot water by 3.2 %, water supply and sewerage collection by 8.7 %. Rents increased by 15.3%, and in the case of dwellings with regulated rents by 22.8%. Private sector rents were only up by 1.6%. Downward pressure on the consumer price level came decreases in clothing (by 3.0 %) and footwear (by 3.7 % ) which were partly the result of winter sales reductions. Data from the Czech Labour Ministry show that over 45,000 people lost their jobs in January, bringing the unemployment rate up 0.8 percentage points to 6.8 percent, the highest level since April 2007. The number of vacancies was also down, following a pattern which now goes back over six months, and which is perhaps the clearest indicator we have of the tightening in the labour market. The Czech central bank cut its benchmark interest rate for a third consecutive time at the start of the month as lower economic growth gave the reason to do so and declining inflation opened up the possibility . 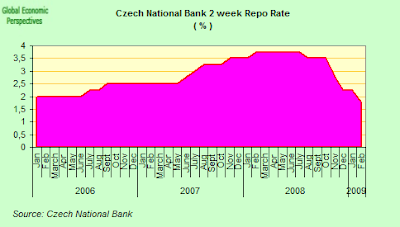 The Ceska Narodni Banka lowered the two-week repurchase rate to 1.75 percent, matching the record low of September 2005, from the previous 2.25 percent. Nonetheless, the posts are very brief for starters. May you please extend them a bit from subsequent time?